If you own an upscale restaurant where parking can get tight, offering valet parking is the perfect solution. It will provide your restaurant with an extra source of revenue and customers will appreciate the fact that they won’t have to worry about missing their reservation because they can’t find parking. With any high-end restaurant, it is important that your customers feel comfortable, but it is equally important to take care of your employees as well. A prefabricated valet booth will take care of all of these considerations and more! A valet booth will keep your employees comfortable and your clients happy. Let’s face it: Being a valet can be great when the weather is nice, but there is nothing worse than standing around in cold or rainy weather just waiting for the next customer to come by so you can briefly warm yourself up in their car. Don’t force your employees to be uncomfortable just because the weather refuses to cooperate! Instead, provide them with a comfortable and reliable prefabricated valet booth that will protect them from the elements. At Shelters Direct, we can even outfit your valet booth with an HVAC system and a restroom so that your employees will be comfortable for the duration of their shift and can focus on providing the best service possible. A prefabricated valet booth will not only keep your employees comfortable, but it will also make your business look more professional. By providing a permanent and established place for your valets to wait for incoming cars, your customers can be confident that your valets are legitimate and not indiscriminate scammers who are looking to rip off unsuspecting diners. Your valet booth can be designed to mimic the architecture and look of your restaurant so that it will look as if it has always existed. Shelters Direct has been a trusted source for the supplying and installation of booths, canopies, shelters, and prefabricated guard booths for over 20 years. We work with a wide variety of clients throughout the United States and abroad to provide quality products and expert installation so you can be confident that we will get the job done right. 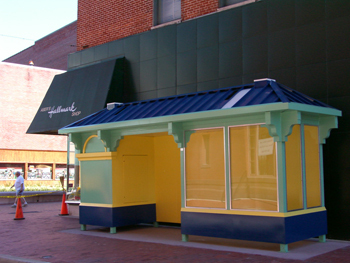 Interested in learning more about how a smoking shelter could benefit your business? Contact us today! And don’t forget to keep up with us on Facebook, Twitter, Google+, and LinkedIn too. This entry was posted on Friday, July 22nd, 2016	at 12:21 pm	. You can follow any responses to this entry through the RSS 2.0	feed. Both comments and pings are currently closed.